With all the marketing around these days, it is difficult for patients to know what is important and what is not regarding oral hygiene. The most important aspect of your oral hygiene is cleaning the food debris and plaque off your teeth regularly and thoroughly with a toothbrush. Other aspects, such as type of toothbrush, type of toothpaste or mouthwash are much less important and often only confuse the issue. The aim of tooth brushing is to physically remove all the plaque/food debris off every surface of every tooth. At the same time toothpaste will be applied to the teeth so that the fluoride in the toothpaste can strengthen them. The way that you actually brush is less important than the fact that you are thorough i.e. brush all the tooth surfaces and gum margins very well. A manual brush with a small head and medium bristles is fine but many people find that electric brushes make it easier to get a good result. Know how long two minutes is! This is the minimum time needed to thoroughly brush all the teeth. It may be helpful to wear a watch while brushing initially to time yourself. Have a set routine of the way that you brush and brush this way every time, twice a day. For example, start on the outside of the upper right back teeth, brush along the sides of the teeth especially where the teeth meet the gums (gum margin) slowly moving all the way round the outside to the upper left back teeth. Then change to brushing the inside gum margin right back round from the upper left to the upper right side again. Now move to the lower jaw and again brush the gum margin round the outside first from right to left and then the inside from left to right. Lastly, brush the biting surfaces of the teeth. After brushing, it is best to just spit out the toothpaste without rinsing. This allows some of the toothpaste to stay around the teeth for a prolonged period to help strengthen the teeth. When you think you have finished brushing take time to inspect the teeth and gums in the mirror - if there are any areas of the gums that are red and bleeding, these need to be brushed more thoroughly to prevent this inflammation in the future. Any visible plaque/food debris still remaining on the teeth must be removed by further brushing. Awkwardly positioned teeth, gaps and wisdom teeth are often difficult to clean with a normal toothbrush. For these areas an "inter-space brush" is useful. It has a normal handle but a very small bunch of bristles at the tip and is easier to get into those difficult-to-reach areas. To clean between the teeth, either floss (for very tight gaps) or "inter-dental brushes" (for wider gaps) are needed. Inter-dental brushes (sometimes called "tepe" brushes) are very small brushes that can be pushed between the teeth and are quite easy to use. Ask your dentist/hygienist which size you will need. If the above special cleaning aids are recommended by your dentist or hygienist, they must be used at least once a day (usually in the evening when you have most time) and will add a few more minutes to your tooth brushing routine. You should use these aids before you go on to using your normal brush. Brush thoroughly for 2 minutes twice a day. Brush in a methodical way so that you brush following the same pattern each time. Inspect the teeth and gums after brushing to check all visible plaque has been removed. 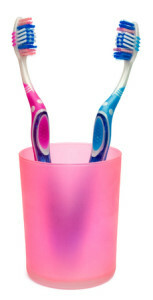 Extra brushes are often needed for awkward areas and between the teeth.